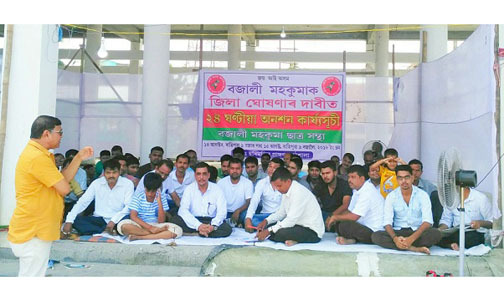 The 24-hour hunger strike, started by the Bajali Sub-division Students’ Union of Barpeta district at Pathsala, concluded on Wednesday. The hunger strike, led by Bajali Sub-division Students’ Union president Damodar Roy and secretary Himangshu Sarma, started at 9 am on Tuesday, in front of the AASU office in Pathsala town, and ended at 9 am on Wednesday. It may be mentioned that during the last State Assembly election campaign, Himanta Biswa Sarma, now Finance, Health and Education Minister, who came to Bajali to campaign for coalition candidate Pabindra Deka, had promised that Bajali would be declared as a district if they come to power. Sarma had said Bajali would be upgraded as a district at any cost to take forward the development graph of the area. But as no step has been taken to declare Bajali as a district, the Bajali unit of the AASU took the decision to stage the hunger strike.